We pick the crème de la crème of the colourful Thai capital’s coolest restaurants, bars, and shops. Undoubtedly, Bangkok is consistently one of Asia’s top travel destinations. The eclectic Thai capital maintains its creative influence and popularity, thanks to a steady stream of lifestyle ventures that never cease to surprise and delight. In a city that thrives on a communal spirit and sense of place, keep on reading for our pick of the cultural and gastronomic hotspots that are not to be missed on your next Siamese sojourn. This hip “urban rustic Thai” restaurant is the latest offering from power culinary couple Duangporn Songvisava and Dylan Jones of fine dining institution Bo.Lan. We love the laid back, vintage-kitsch décor, which is evocative of a shop house from a bygone era. Err does Thai agriculture proud, showcasing natural and local ingredients served with a street food vibe. The riverside location near Wat Po and the Flower Market is perfect for a leisurely post dinner stroll, to ward off that food coma. Owned and designed by Thai design maestro Ou Baholyodhin, the former Creative Director of Jim Thompson, this café and restaurant is an Insta-worthy culinary feast. Formerly a shop house, this five-story building has been given a new lease of life, through an eclectic blend of interior styles. Think European orangerie meets chinoiserie, with a glossing of Ou’s signature glamour. Coffee lovers will keep returning for the café’s exotic signature blend, and a French chef creates the all-day dining menu, with comforting pastas and pies, fresh homemade pastries, as well as fusion dishes such as Paella Tomyum Seafood and Asian Boeuf Bourguignon. Funky, fresh, fiery. These words illustrate Sri Tat, a buzzing eatery in Sukhumvit 33. Trat is the easternmost province along the Thai coast, and the owners have successfully translated this region’s signature cuisine into a refreshing and cool concept. Adorning the main dining room is a Warhol-style mural of the owner’s mother, a former beauty queen, alongside turquoise walls, leather banquettes, and sleek wood furniture. The 18-page menu is sure to satisfy your every savoury craving, whilst the bar serves up colourful cocktails to calm your palate from those spicy curries. One of Chinatown’s most happening and lucky spots is Ba Hao, meaning the auspicious “number eight” in Chinese. 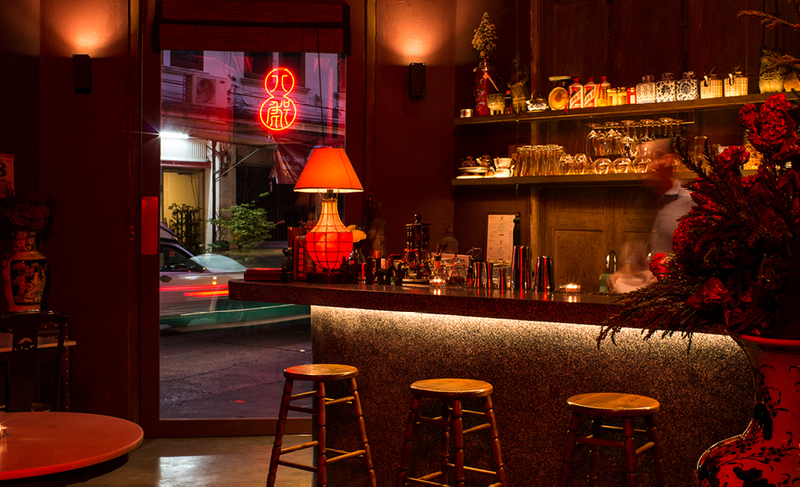 This is the neighbourhood’s ultimate Chinese-themed bar, which transports you back to Bangkok’s Chinatown in the 70’s. The cosy décor feels like an old-school movie set, as this watering hole brims with eclectic and vintage curios and moody neon lights. Drink and feast your night away with comforting Chinese-style street food such as jian bing and mantou, perfectly paired with epic Sino-inspired cocktails such as Forbidden Gold and Five Rivers. Yen Akat in Sathorn is quickly becoming a hub for conceptual dining and drinking. One of the newest kids on the block is Cactus, nestled in a Californian-style leafy garden, reminiscent of the sunny state’s laid-back lifestyle. Created by Sanya Souvanna Phouma of Maggie Choo’s, and rising interior star Shelley Kwok, expect themed cocktails created by mixologist Joseph Boroski to whisk you away on a tropical journey. The drinks are a fun and sophisticated twist on classics. We love It’s A Tiki Situation, a blend of Havana Club Rum, Grand Marnier, homemade coconut cream, and pandan syrup. Bangkok’s rooftop bars are one of the capital’s icons, so be sure to stop Siwilai City Club, an all-day social club at the Central Embassy rooftop. The concept of “Beach in the Sky” permeates the space, which spreads its drinking and dining experiences over six zones. After dark, local and international tastemakers flock here to enjoy live music and DJ performances over a curated cocktail menu. Designed by Yabu Pushelberg, interior creators of the Park Hyatt Bangkok next door, the vibe is one of relaxed and contemporary sophistication, decked in a palette of subtle sky blues and sandy beiges. Bookworms rejoice. Head over to this stunning sanctuary, where books are a central design feature. Lose yourself in the multitude of books, where you are encouraged to linger, and to interact with like-minded folk. Relax, explore, and be inspired. The open layout is the perfect melting pot for intellectual and gourmet discovery, collaboration, art exhibitions, and retail therapy. Designed by Japanese firm Klein Dytham Architecture, the high ceilings, indoor greenery, natural light, and light wood nurture a sense of wellness, calm, and mindfulness. Opened a year ago, Warehouse 30 has quickly become one Bangkok’s most trendy creative, cultural, and artistic hubs. Located in Charoenkrung, one of the city’s first roads, famous Thai architect Duangrit Bunnag transformed abandoned WWII-era warehouses into a 4,000-sqm lifestyle and retail space with contemporary and edgy flair. The design and vibe here is a fusion of old and new, and the original architectural features maintain a sense of place and history. A sense of community is promoted, with a small event space for screenings, yoga classes, as well as a robust cultural programme that has even hosted a TEDx Talk. Cosmopolitan community is the concept behind The Commons, an industrial-style eco-conscious mall in Thonglor, which redefines the notion of the indoor and outdoor. Rocking an urban hipster vibe in what feels a grown-up playground, the space is divided into four floors. Tasty delicacies are aplenty, where high meets low and East meets West. The diverse selection of shops includes vintage store Treasures, botanical boutique Plant House, wine merchant The Barrel, and children’s educational shop Enginou. This mall furthers a sense of inclusion and socialisation with its open layout, grass lawn, and gatherings for millenials, professionals, families, and eco-warriors alike. Chinese settlers to Bangkok once occupied this site’s warehouses and shrine some 150 years ago during King Rama IV’s reign. Today, Lhong 1919 is a charming heritage site that stays true to its colourful architecture and past, whilst showcasing curated designer ware. Preserved Chinese murals are a tasteful and enriching backdrop for boutiques that sell jewellery, home accessories, furniture, leatherware, scented candles, mementos, and fashion. If you have time, pay your respects to the Chinese sea goddess Mazu at the shrine, and stop by for a Thai bite before leaving by boat. For more on Bangkok, read our gentleman’s guide to the city; and don’t miss the rest of our far-flung coverage under the Travel tag!